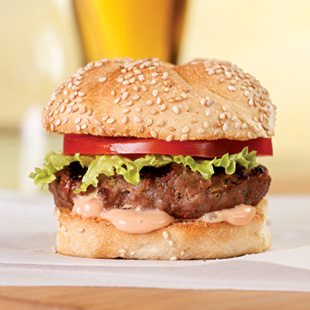 We’re big burger fans in the EatingWell Test Kitchen—and we’re not the only ones. The average American consumes approximately 156 hamburgers a year. It’s a food that is near and dear to our hearts. Maybe a little too near, in an artery-clogging, waist-expanding sort of way. A single hamburger (without fries) at popular sit-down chain restaurants can top off at around 800 calories, with the same amount of saturated fat (around 15 grams) that you’d get if you ate 12 1/2 strips of bacon. The Bacon Calculator: How many slices does your dinner equal? But don’t take burgers off the table yet. Our three tips for making a healthier burger will help you enjoy this classic favorite without compromising any progress you’ve made toward bathing-suit season. Check them out and then fire up your grill to make our healthier but oh-so-delicious recipes for a Classic Hamburger, Chicken Cordon Bleu Burger, Inside-Out Cheeseburger and more burgers. It’s time to put burgers back on the menu. Buns contribute significant amounts of sodium to a burger. (The average bun has around 200 mg.) Compare brands and choose one with the least amount. If you’re worried about sodium, eat your burger without the bun. Pay attention to the fat content of ground meat to keep saturated fat and calories in check. Some ground meats are clearly labeled with the percentage of fat. For example, 90%-lean (or 90/10) means that 90 percent of the weight is lean meat and only 10 percent is fat. Not all ground meat is labeled with the percent lean. Pork may be just listed as “lean” (which means it has no more than 10 grams of fat and 4.5 grams of saturated fat per 3-ounce serving). Ground bison is not often labeled but typically has 8 to 10 percent fat. Ground chicken is labeled “breast” (which is the leanest) or simply “ground chicken” (slightly higher in calories and fat). Very lean meat can make dry burgers. So it’s a balancing act to keep burgers healthy and at the same time juicy and delicious. We opt for meat that’s 90%-lean or leaner, but we don’t always choose the leanest available grind (e.g., 99%-lean chicken breast). Incorporating additional ingredients, such as roasted chiles, caramelized onions or cooked whole grains like bulgur or brown rice (which will give you a fiber boost too), also helps to keep your burgers moist.